Trent and I got married on 5-18-08, went to Chicago for our honeymoon, then came back to Waco and got settled in our first little apartment. 400 Ivy Ave, #155. We had a 6:40 am flight out of Chicago and were back to our apartment by noon. I had managed to move all of my stuff out of my previous apartment and into the new one before the wedding but Trent wasn't as successful, so we had handed Caleb and Trent's parents keys and said "have fun, please move Trent while we are on our trip." :-( I still feel bad about that. So we got back to our little home, tired from getting up at 3 am that morning and traveling, and found wedding gifts in the dining room, an entertainment center in the kitchen, clothes on the sofa, my keyboard leaning against a wall and on and on. We stared at everything for a moment from the three feet into the doorway that we were able to move. Then we decided to take a nap before tackling it all. That was our first few minutes in our new married home. After napping, and letting select people know we were back from our trip safely, we tackled our apartment, got it all in order, got rid of a LOT of stuff, and slowly made it our own. It was a wonderful first home. 805 married square feet. Little bitty washer and dryer that barely fit three pairs of Trent's work pants in one load. Two stories with upper and lower porches. And the closets. Oh the closets. Closet under the stairs, outdoor closet upstairs off the balcony, book nook around a weird corner wall upstairs, a closet at the top of the stairs, two small closets for Trent which we used for separating work and nice clothes, and a lovely large walk-in closet for me. So. Much. Closet. Space. Loved it. 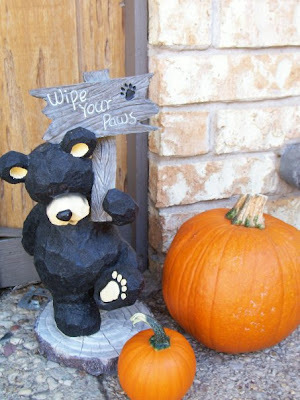 Our front porch, decorated for fall. Our dining room, which was used as my office more than a dining room, as you can see. 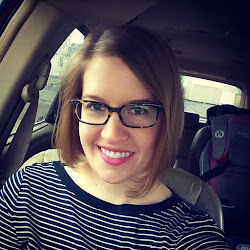 I was finishing up my masters degree in taxation during the first summer and fall that we were married. (nerd alert, I know) That big, fat red book is the internal revenue code. We hung that mirror in an effort to make the room feel bigger. Trent would not let it be centered because there were no studs in the center... I believe this picture was taken pre-water leak from the tub above. 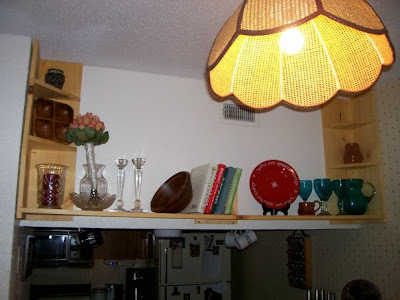 This is our ghetto-fabulous lamp shade, a slight view into our tiny kitchen and the awesome shelf that my husband built to fit the dining room wall. This shelf now hangs in our home office in our house, and I often look at it and think "wow, our dining room was small." 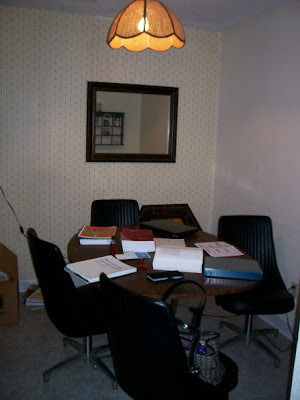 But I got a lot of studying done in that dining room and appreciated the space. 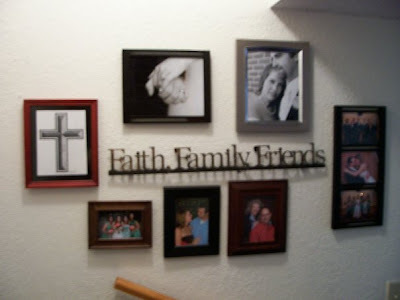 Picture wall in the stairwell! For our first married Christmas in our little home, I insisted we have a Christmas tree. We looked at small artificial ones but they were all pre-lit and flippin expensive, and we just didn't have room for a normal sized one. So we went on a pilgrimage to find a small tree of some sort and ended up at Lowe's. There I spotted it. And flipped. out. There sat a little bitty live tree that was $15 and sooooo cute and perfectly perfect. I'm pretty sure I squealed when I saw it. Trent can vouch for that. 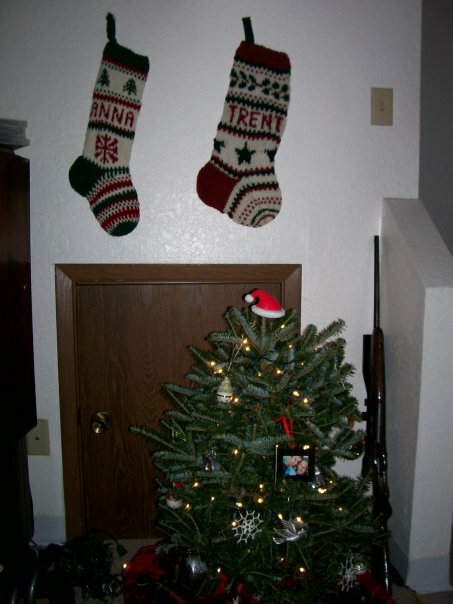 We brought it home and I set to decorating it and hung our stockings. Yes that is a rifle leaned in the corner next to it...Trent was refinishing the stock at the time. We named our little tree our "Christmas Shrubbery" and just loved it. 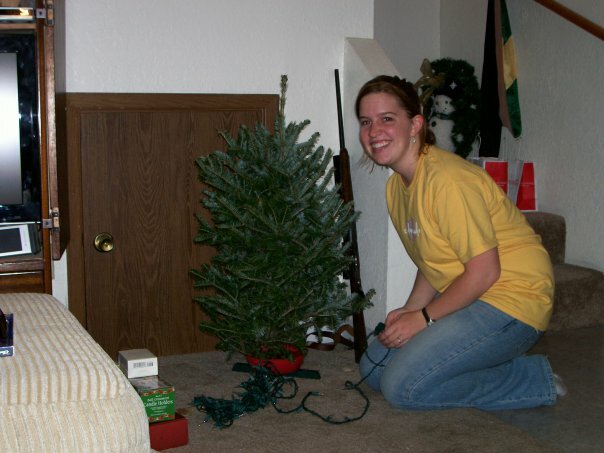 It was the perfect size for our space and for the amount of ornaments we had at the time (or lack thereof). I shoved a red plaid blanket around the bottom in place of a tree skirt and called it perfect...perfect little Christmas Shrubbery in our perfect little apartment.